Sweet Weather for Valentine’s Day? A Ho (Ho Ho) Hum December-To-Date? Weather Folklore – Facts or Fiction? On the Road to a Record Wet Year? What Happens to Water Underground? How are Drought Conditions Classified? What is a Snow Survey and Who Uses It? February - End of Winter or Beginning of Spring? Will November Snow Storm Leave us a White Thanksgiving? Valentine's Weather - Lovely or Heartbreaking? Orange You Glad It's Mid-November? And Now for Something Completely Different - Heavy Rain! A Not So Wintry Start to Winter? Precipitation Record for New York State! March - More Winter Than Spring? White Christmas? Dry New Year's Eve? 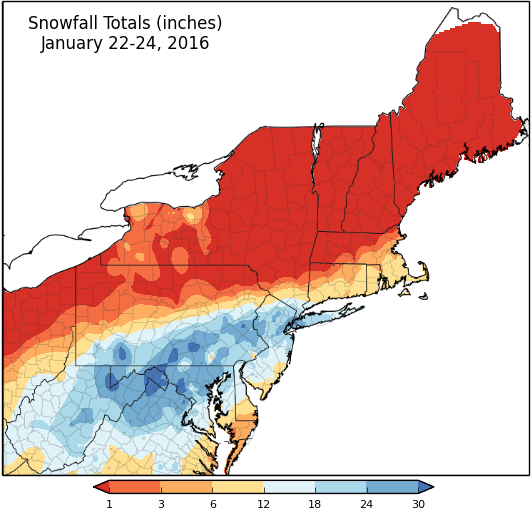 Ocean Warming & Marine Fisheries in the Northeast U.S.
Over 30" fell in some areas. The Northeast region was hit by a blizzard this weekend, with over 30" falling in some areas, such as Kennedy Airport, NY and Allentown, PA. Records were broken for 1-day and 2-day snowfall totals. In New York City, there was a travel ban and people were able to walk in the streets, Broadway shows were cancelled, and a state of emergency was issued. New Jersey saw not only record-breaking snow, but the storm surge caused icy floodwaters to close roads and damage houses. The Pennsylvania Turnpike was closed overnight, stranding many people in their vehicles, because tractor-trailers couldn’t traverse the snowy hills. Thousands of flights were cancelled, disrupting travel even outside the Northeast. Many businesses and schools in Washington, D.C. remain closed on Monday January 25th. 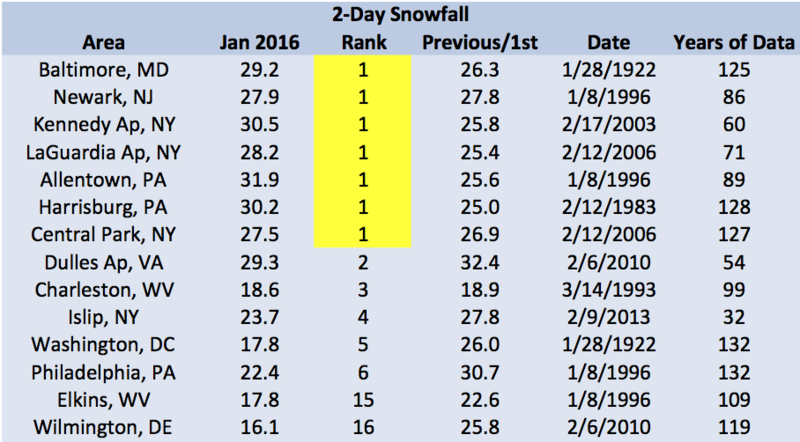 1-Day snowfall amounts and rankings, including the record or previous record. 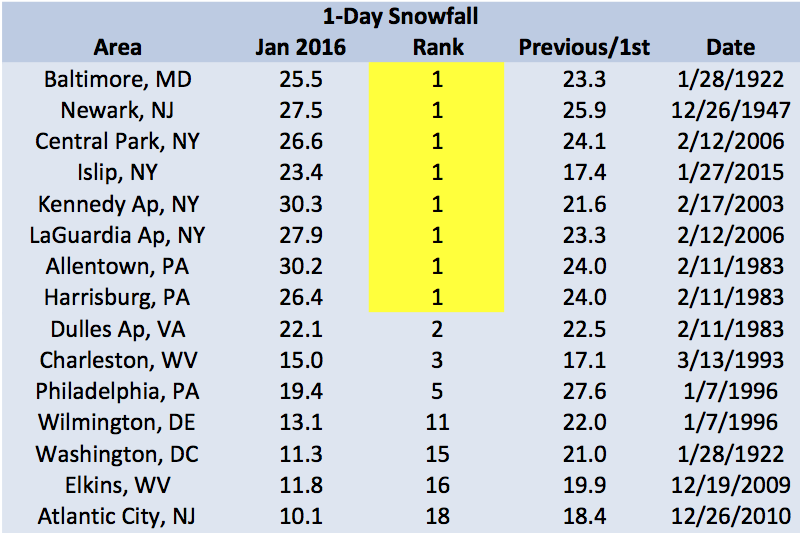 2-Day snowfall amounts and rankings, including the record or previous record. NRCC supports a three-tiered national climate services support program. The partners include: State Climate Offices, Regional Climate Centers, and the National Centers for Environmental Information.